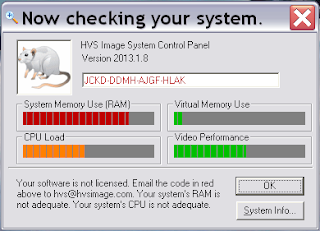 One of the interesting features of the HVS Image 2013 is the ability to run get exceptional result from cheap generic hardware. The demo of this that we saw was on a six year old 1.7 GHZ Pentium Dual Core, a 12 meter active extension cable and a bottom of the range Microsoft Lifecam VX-800. 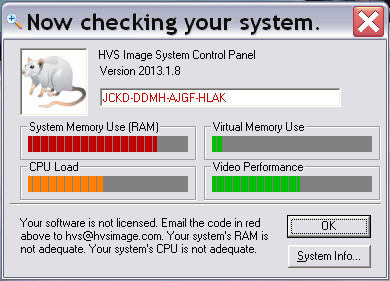 This configuration did show a performance warning on the new HVS Image 2013 system performance checker. This is a little app that runs automatically when the system is started to test whether there are possible problematic changes to the computer or system of issues with the machine's operating environment. Actually tracking was excellent with no lost frames or data points even on this system. As they say though - don't try this yourself at home guys. HVS do say that it would be better if you used a camera like the Lifecam Studio which has autofocus and a 1080p HD sensor and a computer like the Panasonic Toughbook. One of the things is that the HVS Image will now video and automatically compress all your trials if you like it to (and date and time stamp them too if you want) so its good to have a system with plenty of storage. HVS have always been string on safety so having a system that electrically isolates you from the mains in your "wet" environment and like the Toughbook is water resistant is highly favored.